Industrial vacuum cleaners are known for their versatility and reliability. Not only can these units handle a significant amount of waste, but their user-friendly controls ensure that even large tasks are able to be tackled efficiently. As you can imagine, not all units are created equally and some are better suited for addressing specific surfaces than others. This is why consulting with a professional industrial vacuum cleaner hire service is always a wise choice. However, it is still important to understand which units can be used in combination with concrete floors as well as some of their main advantages. One of the first issues to address involves how easy the vacuum can be manipulated during its operation. Some of the most effective are equipped with castor wheels. This also signifies that they can function within environments associated with tight turning radii. However, they are still powerful enough to deal with a massive amount of space within a short period of time. Industrial vacuum cleaners designed for concrete surfaces should also be able to handle a wide range of materials and particulate matter. While fine dust is an obvious concern, other substances such as liquids and even oils should be effectively addressed. One example can be seen in the agile design of our CFM SOL 3000 model. Thus, even challenging cleanup tasks can be dealt with in a timely fashion. While there is no doubt that suction power and versatility are important factors to address, we should also keep in mind that certain industrial locations are associated with environmental hazards. The fine dust often accompanying grain silos and chemical production facilities are two examples. In such instances, vacuums powered by compressed air as opposed to electricity should be chosen in order to reduce the chances of an accidental explosion or arc flashes. 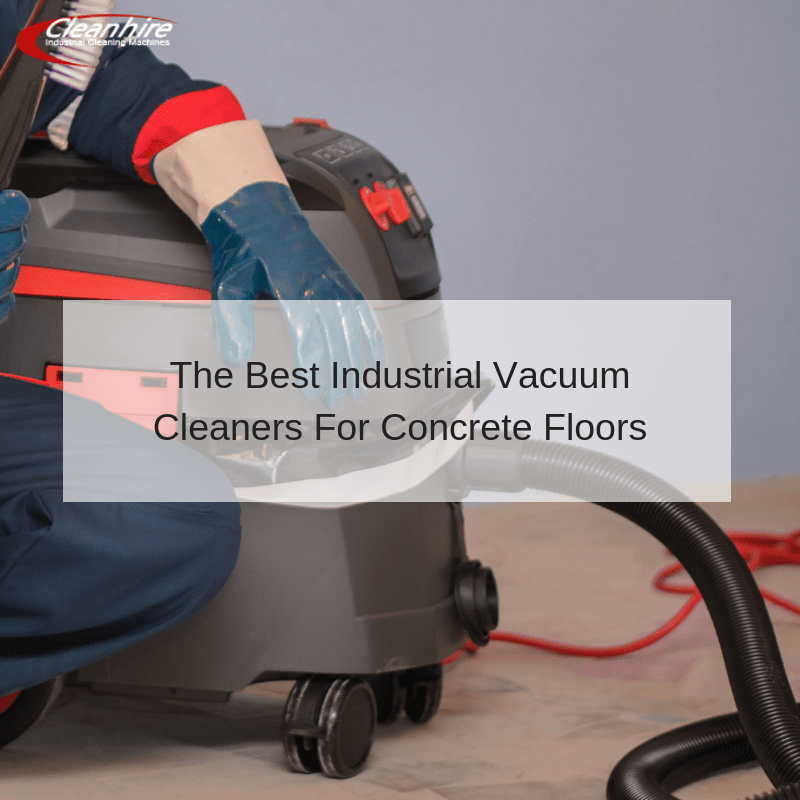 The experts at Cleanhire supply a wide range of vacuum cleaners suited for concrete floors. Not only are these units equipped with some of the latest technological innovations, but they are maintained to the highest of industry standards. If you have been looking for a powerful solution to your maintenance needs, we are here to help. Please examine our models in greater detail and if you require further assistance or to hire a specific model, we ask you to contact a representative.